For user centered product design the application of digital human models has been widely established in automotive industry. These models are used to optimize the vehicle ergonomics in an early phase of the CAD design. The integrated human behavior models are based on experimental data of healthy average age people in general. Hence these models cannot be used to develop ergonomic human machine interfaces that are also suitable for ageing customers. Applying the current digital human engineering process to elderly occupants, however, is a requirement gaining importance with the demographic change in industrial countries. In order to fulfil this requirement, the most important human engineering applications of the digital human model RAMSIS were extended to take age-related human performance changes into account. A comprehensive literature review the research was conducted about age-related vision limits, acuity, glance eversion time, joint angle limits as well as joint strength over age. The results were transferred to the RAMSIS human model to extend the simulation database. The enlarged simulation database facilitates applying the current human engineering applications of RAMSIS to occupants with age-related restrictions. 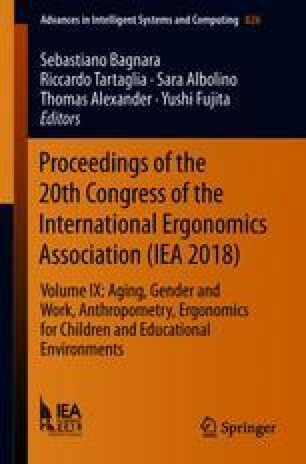 The differences in simulation results of different age groups were analyzed with respect to relevance and significance in the ergonomic vehicle development process. The automotive test use cases were set up for the criteria posture, reachability, force effort and visibility for occupant models in a vehicle model. The simulation results differ significantly between the age groups. Hence, the extended simulation methods of RAMSIS support human engineering applications for age-based automotive product planning. The article would have been impossible without the support of the German Federal Ministry of Education and Research (Project: VirtualAging, FKZ: 01IS15002C) from 01.05.2015 to 31.10.2017.